The Drawing Room was originally Frederick Sargood’s study. It was enlarged to the North in the 1897 extensions of the house, and redecorated to become the drawing room. In 1918 this room was decorated by the Nathan family and is one of the few rooms they were known to have made significant changes to. 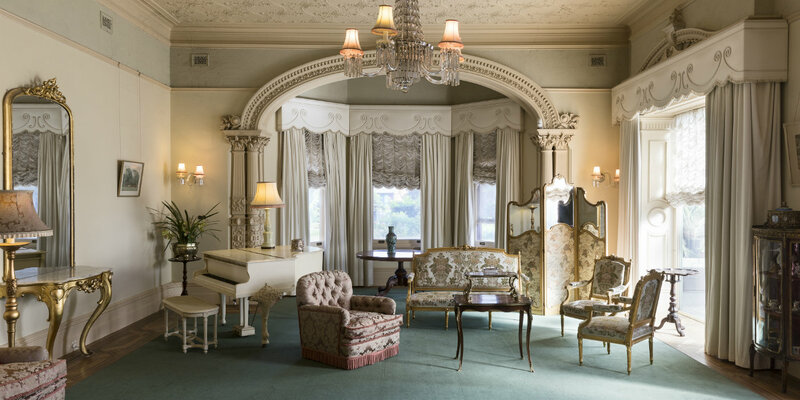 Louisa Jones included the drawing room in her “Hollywood Style” renovations in 1938-39, which is what you see today. Until the end of the 19th century, the current conservatory was located on the north-west corner of the house. 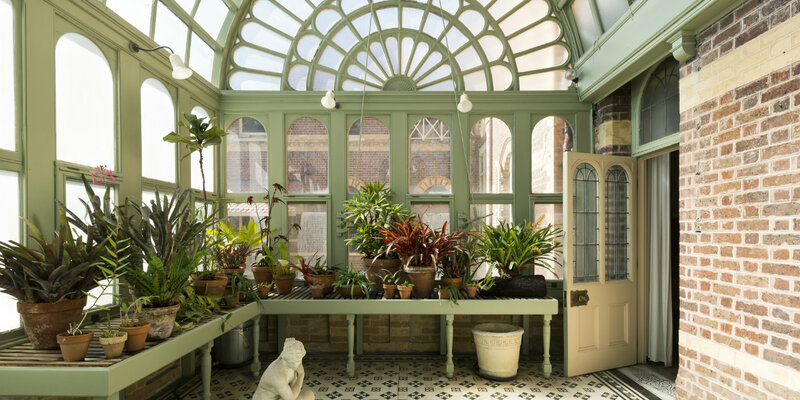 In 1897, the conservatory was moved to its current location so that the exotic plants on display inside it could be enjoyed by those in the drawing room. This room was originally designed as the mansion’s drawing room, with a polygonal window looking over the magnificent lawns. The space was converted to the sitting room in 1897 and the window changed to the present square design. During the late 1930s renovations the room took on its current appearance. 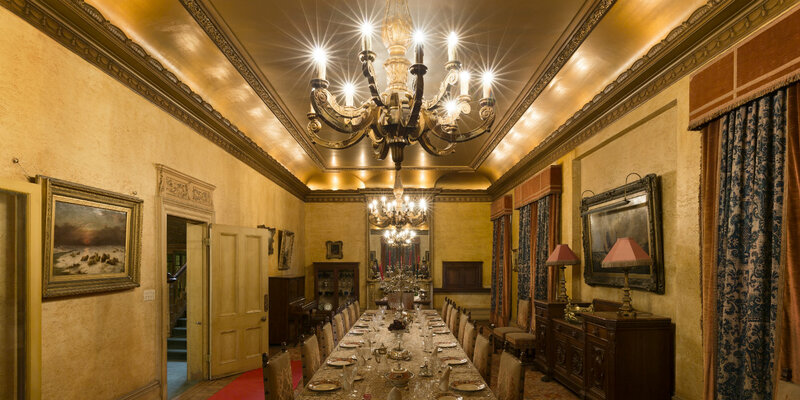 Frederick Sargood’s original dining room was smaller and adjoined a covered pavilion that was open to the air and gave views of the garden towards the western lawn. The dining room was redecorated in 1938 by Louisa Jones. The ceiling papers, frieze and cornices were removed and the current bronze coloured plaster ceiling and decorative cornice were inserted. The ceiling, illuminated by concealed lights and wooden electroliers, is pure Hollywood in style, making the dining room a wonderful compliment to the glamorous entertaining areas of the ballroom and swimming pool. 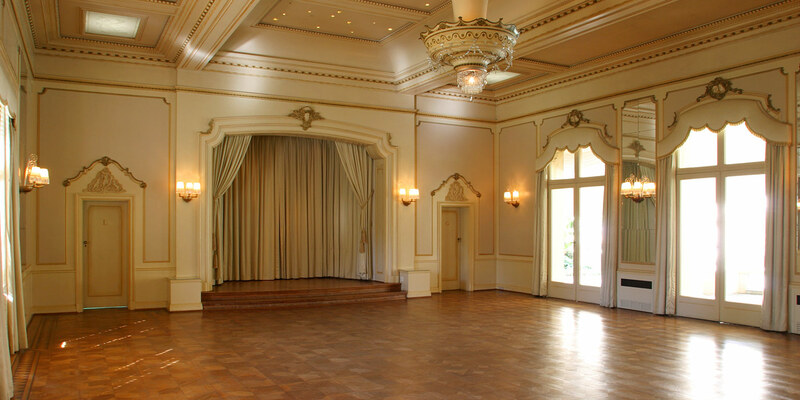 Rippon Lea’s original ballroom stood where the swimming pool is currently located. The original building was intended by Frederick Sargood to house some of his beloved plants and was constructed as a glasshouse, but his daughters persuaded him that they needed a ballroom and so the structure was converted. Louisa Jones’ love of the 1930s Hollywood style prompted her to demolish the old ballroom and replace it with the swimming pool. She converted Sargood’s billiard room into a ballroom during the late 1930s. This room has been the main bedroom in the house since 1868. The ‘Best Bedroom’ has always been a part of a suite of three rooms, including a dressing room and a bathroom. 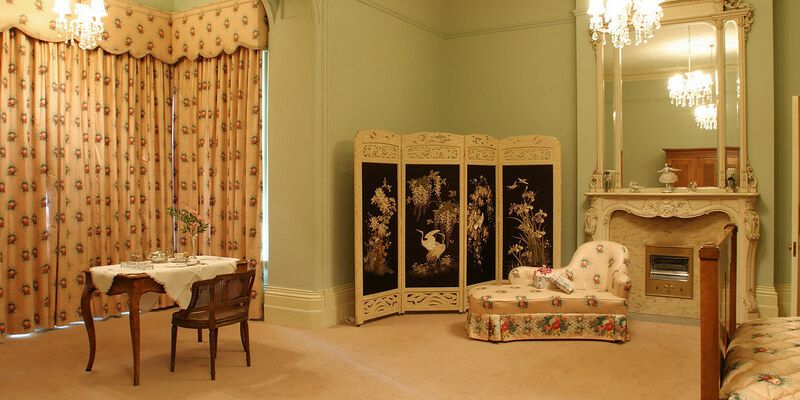 Since the Sargood family left the property at the turn of the 20th century, the bedroom has been decorated at least three times. However the current decorative scheme reflects the changes that took place in the 1950s. It features mushroom pink carpet, blue walls and ivory coloured joinery. 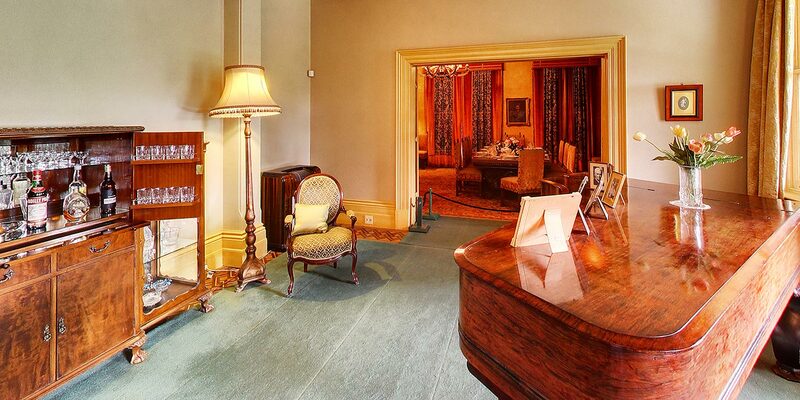 Take a 3D virtual tour of the Mansion and all its rooms on Google Maps. 3D interactive photography courtesy of Barney Meyer.